Sometimes your printer documents stucked or hanged and stop responding. You cannot continue to print that documents or even you cannot cancel the jammed print jobs. If there is more documents in print spooler window, that will be hard to delete the printer queue. 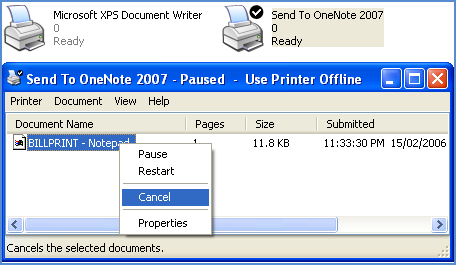 Most people only restart the system suddenly and then delete the stucked printer documents. But there is a simple way clear the printer documents queue without restarting computer through windows command line commands. This command line stops the printer spooler, clear the documents and restart the printer spooler in the fresh way within a seconds. How to Delete all Hanged Printer Documents? 1. Go to Start->Run and type the cmd to Open the Command Prompt. If you are using Windows Vista / Windows 7, you have to open the command prompt in Administrator mode. For this right click on cmd.exe and select “Run as Administrator”. These commands will clear all hanged documents in your printer and you can continue your printing job easily. There is another simple and quick way to run these commands is creating a batch file and store these commands. Open the Notepad application and paste the following commands and save to “clearspooler.bat” or simply download the file below. (Note: when saving the file, you must type with quoation marks). After that when your printer stucks, simply click the batch file once and you will be get out of this problem. That’s all.